I write my mother a short letter to let her know I am concerned about my brother Willis who has contracted the flu. I am writing in the “Y” while waiting for an answer to a call I put in for you folks. I got a pass today from Smoky Hill Flats to [return to] D.2. [Detention Camp 2] and Johnnie Conrow said that his mother told him on the phone that [my brother] Willis had the influenza. I am afraid I can't get my call thru because I have been waiting a long time. It sure is tough that Willis had to get sick. I don't see how you can get along now. I want to hear from you as soon as I can but my mail out there is uncertain. I write my mother and brother to tell them about the special training I have been receiving. Yesterday I got 3 letters from you folks and 2 from Minnie. Some of them were written last week. It sure was good to get them. We will have to stay here another week so I borrowed some paper and maybe I can get an envelope somewhere. We used to think that D.2 [Detention Camp 2] was a bad hole to live in but it would seem like home after being in this place. It is all muddy [here] and the trenches have water standing in them in places. I am sure glad to have come out here tho because the stuff we are getting is lots better and more interesting than the men at D.2. are getting. Today we went thru a trench attack. Each man was issued 20 rounds of ammunition and 2 grenades. The automatic gunmen had sixty rounds each and the bombers had 5 extra grenades. Next week we are going to pull off quite a fussy attack and they are going to bring men from Funston and the Detention Camp to watch it. I wish I had a Kodak so that I could send you a picture of me in my helmet and gas mask. We have the Enfield rifle now too. Our Lieutenant said today that we who are getting this special training will be the skeleton of a new division which will be formed at Funston when the 10th leaves. Of course that is not absolutely a fact because plans are changed over night. I hear that the quarantine for Spanish Influenza was lifted this morning and that another was put on for spinal meningitis so it may still be sometime before I can see you folks. You wrote in your last letter as tho I didn’t try to get a pass to come home. I did but it was useless. No single men were given passes, I know. Noble is married and so he got his pass and [James] Sparks [who is not married] went to town without a [real] pass. He had one of his friends typewrite an imitation of a pass. The passes issued here are just typewritten on a slip of paper and signed by the company commander and the major. Sparks signed this slip with a pen and got by with it. In the pass, he said he was going to Manhattan to visit his wife, Mrs. James Sparks. He nearly got caught too because 3 men escaped from the guardhouse that night and Sunday morning all passes were copied by the M.P.’s and were supposed to be checked up at headquarters. But that takes so much work that they probably didn’t [do it]. You may be sure that I will have a pass just as soon as I can. I never did get that cake you sent in the mail. We are supposed to be issued overcoats tomorrow. We were issued sweaters last night. I sure wish I could get back to camp and get my wool socks. Maybe I can tomorrow. It sure is hard to keep your feet dry here in this mud and water. Some night next week we will spend all night in the trenches. I am slowly beginning to get accustomed to this life. In a little while I expect I will like it. I don’t mind the grub a bit anymore and it is worse here than it was at camp because they just have a field kitchen and there are about 250 men to feed. We walked clear over to Fort Riley night before last for a bath but we haven’t any place to wash our clothes. Minnie asked me in one of her letters about those samples of grain we got in Crops Lab. I had told her she could have them for her school work if she wanted them, so Bill [Willis], will you label them for her and tell her how to fix them up? 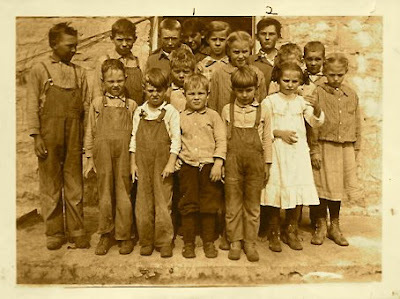 16 of the 17 schoolchildren in Minnie Frey's School. Photo taken October 1918. The Krause twins, Lloyd and Floyd, are indicated by numbers 1 & 2. Minnie writes me that her school is definitely canceled for the following week. I rather hesitate to write much [since] you said you couldn’t receive or send out any mail. So I don’t know when you will get this. I guess three or four [letters are] over there now. I thought you wouldn’t write till this weekend. Then you would probably be there to get them. But your mother said today that Mrs. Conrow told her you boys were going to be out there yet next week, so maybe you won’t be there yet. We sure have been having a siege of gloomy weather, along with gloomy war news – not a very good combination. The paper said the sun may shine tomorrow. I’m sure glad. The latest news also was that Germany’s reply was unfavorable. [My sister] Bertha heard from [her husband] Charlie every day. He says he still thinks that Germany will come to U.S. terms before the end of year. He’s not an authority on the matter but I like to hear people say that anyway. Jimmy Seaton has pneumonia and is very sick. Mr. [Ray] Seaton is better one day and not so well the next. I do wish they would both get well. But with Mr. Seaton’s sorrow, I guess it’s pretty hard. Charlie is all over his but he says he could cough his head off yet if he got started. He didn’t quit work at all. I can’t go to church, Sunday School, or anything like that tomorrow, so I have a lot of magazines here and I’m sure going to read. That will be lots of fun. I did think until today that possibly you would get to come home. I had to give it up tho as usual. But next Sunday I expect you sure will get to come. [The] quarantine [will be] off and by that time you will probably be thru out there where you are now. Riley County went over the top [raising] $70,000. I sure am glad. But they need it [as] some places won’t make it. Papa just came home and they have everything balanced up. I’m sending you two pictures. I think the one of my school is pretty good. One of the primary children wasn’t there that day. Number 1 & 2 are the twins. They don’t look so much alike because one is smiling. But when they both look sober, they sure look alike. I was worried about you when this bad weather set in. But I heard today you were alright. My, but I’m glad of that, boy. 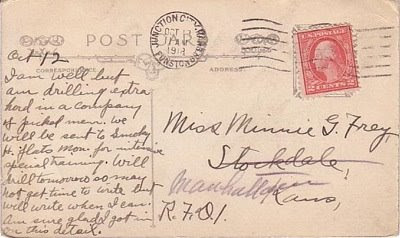 With lots of love and pleasant thoughts, -- Minnie Frey I didn’t have my letter quite ready to send. Papa was late anyway this evening so he went off without it. He said it would get there just as quick if he took [it] tomorrow morning. I don’t believe it will tho. I thought maybe you might get your mail tomorrow, if you didn’t go back to the D[etention] Camp for Sunday. I thought possibly someone would take your mail out. Anyway, I wanted to get this out tonight. I thought I would write some more. I don’t have much to say but I usually write longer letters than this would have been and I don’t want you to think I don’t like to write to you so well. Because I sure do, boy. But I wish I had just lots of good news to tell you. I wouldn’t know it was Saturday evening here. No one going to town – [it’s] just like any other evening. There doesn’t seem to be so much attraction downtown Saturday nights since the [picture] shows closed. I haven’t been to a show since the last Wednesday in August, and I don’t care much about going till you come back either. And yet I would like to see a real good one again like the "Hired Man,” wouldn’t you, Ward? My, Ward, I bet you have been working this week. I can’t seem to imagine very well just what it is like, and some way, boy, I don’t like to think of you as working with that saber and all those terrible things. I like to just forget that part of it when I think about you…..and that is all the time. Ray was over again last evening. Ethel is working downtown – part of the time with her father (he is Manager at the Farmer’s Union feedyard) and today she worked at the cafeteria. I haven’t seen or talked with Kate since I’ve been home. She’s afraid to stick her nose outside the door [for fear] she might see someone sneeze that has the influenza. She’s wise, I guess. [My brother] John had a card from Ed Stahl. He is at Camp Forrest [in Chickamauga Park] Georgia. I’m going to call the School Board tomorrow and tell them I’m sure not going back next week. Today’s paper said that the State Superintendent [of Public Instruction] has made the announcement that the teachers will get their pay just the same and wouldn’t have to make up what they lost. That sure tickles me. I can get my three dollars a day and stay at home too. Then I can go to College next spring [as] I wouldn’t have to make these two weeks up. The primary pupils really ought to have school tho. They will have to miss so much later on. The Hired Man was a silent movie released in 1918 starring Charles Ray who plays Ezry Hollins, a hardworking hired man who saves his money carefully in the hopes one day of going to college. But when his girlfriend's brother gets in trouble for bank robbery, Ezry tries to help out by offering his savings in exchange for the stolen funds. Edward J. Stahl was the 21 year-old son of 44 year-old Fred M. Stahl, a foreman at the Manhattan grain elevator. Minnie writes me a long letter to let me know she thinks her school will be canceled another week due to the flu epidemic. She also mentions efforts to raise Liberty Loan funds on College Hill. I haven’t been writing, boy, the last few days because I knew you wouldn’t be there to get to your mail and I might as well put all I have to say in one letter and you will be there to get this. Tuesday or Wednesday Herbert Bales’ mother called your mother. She said Herbert said you were well. (Doesn’t that sound crazy?) We have been feeling pretty good about you until yesterday. Then we heard the “flu” was getting worse up at Camp [Funston] and we know it is worse at College and around Manhattan. A professor (haven’t heard his name) and three S.A.T.C. boys died yesterday. We went downtown yesterday evening and I hadn’t been there fifteen minutes till two hearses come along taking boys to the depot. I tell you it made me feel awful. I don’t like to see those things. We got some medicine and we are all spraying our throats, so I guess we won’t get it. Last evening’s paper said there probably will be no schools next week yet. I do wish I could go back but I don’t think I’ll get to at all. It sure has been nice this week and that’s been so nice for you, boy. I’ve been hoping every day that it would stay nice and it did till today. But it’s awfully cloudy and rainy today. I suppose you will be coming back to D. Camp today or tomorrow. I’m anxious to hear how you got along out there. Ward, I sure think that was fine being picked out of all those men for that training. I should think it would be hard work, especially working with that old knife, but I’m not worrying about your not being able to instruct. You know how to say it and right to the point. You wouldn’t have to go a mile around to get it said as a lot of those boys would. Does that ‘Model Company’ instruct the rest of the regiment and are the boys that stay there for the bunch of new men brought in taken from this company? You said once that they would keep some there. Was John Conrow one of the picked men? I can’t hardly wait for the days to fly by. The latest bulletin said that Washington [D. C.] was expecting some great events in the course of a few days. But in the meantime, we must make the Liberty loan go over the top. Riley County is way behind yet but they are working hard. Papa and his bunch of men went out today to visit those that wouldn’t give when they first went around. Messer’s Rhodes, Willis, Munger, Kimball, and Teagarden, went around over College Hill yesterday. By noon they had received $1,800 more. He told each group of workers they would send out a strong man from downtown for the last rounds if they wanted him. Mr. Willis said, “Well I’ll tell you men when I get thru with them, there’ll be no use for anyone else to go to them.” That sure sounds like Mr. Willis. Papa said he made them come across tho. This ink I’m using is just awful. Then pen won’t hardly make a mark. Then all the ink comes down at once. It makes the letter look awful. Ernest said in one of the letters he wrote home that one of the higher officers told his men he could always tell when any of them hadn’t received letters from home. Ernest said, “What do you think about me?” The officer said, “I don’t think the devil himself could worry for you more than five minutes at a time.” I think he has Ernest about sized up, don’t you? Eben called [my sister] Bertha yesterday. He is alright now, but he don’t think he’ll ever get out of quarantine. George Haas has been called, so Edith is coming home to stay right soon now. I haven’t heard how the Willis boys are but I guess they are getting well or I would have heard. I’ve been intending to call Mrs. Willis but haven’t yet. If it doesn’t rain too hard, I’m going over to your mother’s this afternoon. It’s rather hard to talk over the phone at times. I don’t see why you were not able to get me [on the phone] Saturday evening. I was right here in the dining room all evening because I was waiting for a call from your mother. So I know Central [Switchboard] didn’t call out here. I wish I did live in town if it would mean I could talk to you. I would sure like to hear your voice again, Ward. I don’t suppose there is any chance of the quarantine being lifted yet this week. But surely will be next weekend. I think it’s a good thing and yet it makes me so mad. Why couldn’t this have been the first two or three weeks you were up there? Because you couldn’t have come home then – but now you could. Mrs. Arnold told me that the 10th Division was going to begin moving next week. Land, I was scared. Because until I got your letter and card Wednesday, I just knew a group of the best men had been picked and were going to have special training. Your mother told me that. And I just felt sure that meant you were going to be sent across [to Europe] soon. And then hearing about the 10th Division leaving, I thought you would probably be attached to it. And with this quarantine on you would be sent off without my ever seeing you. Maybe you think I wasn’t happy when I got your letter. I’m glad you got the things we sent over Sunday alright. Mrs. Conrow said she didn’t see you but she sent them to you by the boys so we thought you would. 21 year-old Herbert Bales’ mother was Alpha Bales, the 55 year-old wife of W. W. Bales – a helper at the College Barn. Herbert’s older sister Ethel was a teacher of domestic science at KSAC. William H. Rhodes was a 48 year-old farmer on College Hill. Richard A. Willis was a 56 year-old farmer on College Hill. John M. Kimball was a 42 year-old farmer on College Hill whose farmhouse was next to the Griffing’s. Thomas P. Teagarden was a 63 year-old farmer on College Hill. I write Minnie about the specialized trench warfare training we've been taking. Well I can get a letter thru now so I will try my best with what I can borrow. I didn’t expect to get any mail or expect to write do I didn’t bring any paper but I borrowed a little. I got 2 letters from you & 3 from Mama today. Some were written last week. It seemed like home to hear so much news at once. Gee, but it is cold tonight. But we could be worse off. Tomorrow we put on a battle – an attack on a system of trenches. We will use live ammunition & live grenades. The lookout here is much more interesting than back at D.2. I wish I could send you a picture of me in my steel helmet, gas mask, & rifle & bayonet. We are beginning to think ourselves real soldiers. When we came out here, we supposed we would only be here a week, but they say we will be here another week anyhow. We thot D.2. was bad but it seems like home now & we will be glad to get back there because here we are fed from a field kitchen & we only brot over our absolute necessities & we can’t buy anything. It is sloppy & nasty now since the rain & those old trenches are a fright. Before we leave, we will spend a whole night in the trenches. This is tame tho, of course, to what it will be later. French & English officers are here instructing us. I have seen so much to write about since I left home that it is hard to pick out what to write about. I sure would like to get to see you. My, but wouldn’t we talk. I have so much to tell you that I can’t write. You said awhile ago that you were gaining weight. I am glad to hear it. My, I would like to see you. Maybe you have changed. It seems so long since I have seen you. I have never had a chance to get weighed but I expect I have gained a little too. Say Minnie, those bottles of grains are at home. You ask the folks for them. I sure wish I could help you fix them up because they aren’t labeled & you can’t tell them apart. I know of a good way to fix them up for an exhibit but I can’t describe it on what paper I have. Ask [my brother] Willis to tell you the different varieties; he knows as well as I do & he will be glad to help you. Minnie, I can’t advise you about your going to college. If I were you I wouldn’t try & decide for quite awhile yet. There is lots of time between now & spring & many things are bound to happen. I have been so irregular myself that I would advise anyone to try & keep as near regular as he could but with you it might be a good thing to go on to school just to keep busy. Don’t work too hard tho. You can tell better next spring what you want to do. As for me, I don’t plan even a day ahead -- not even an hour anymore. Dear heart, we surely will get to live near each other again as we used to. If I were to be home again, you can count on it that I wouldn’t restrict myself to one or two nights without to go & see Minnie. Minnie writes me more news from her father's home in Manhattan. Her school is suspended another week. Well another day about gone and nothing much happened. [My brother] Wayne went over to your place and gathered walnuts. Your mother gave him a lot of apples to bring home. I’ve just been eating them. They sure are good. We don’t have any apples here except what we buy. I got a letter from you today. It was one you wrote Thursday morning. Mrs. Parkerson sent it down from Stockdale. I expect it got there Saturday. I called your mother this morning to see if she had heard from you today. She said she didn’t and that in yesterday’s letter you didn’t think you would have time to [write] this week very much. Just so we get word from you enough to know how you are. I expect you were showered with letters from me about Sunday or Monday. The ones I wrote down here would get there about the time those from Stockdale do. Papa heard in town this morning that the schools will probably be closed yet next week. I sure hope they are not. I’m anxious to get back. The primary children will forget all I ever have taught them and most of all, they won’t take the quarantine off from the Camp. And I’m counting on you getting a pass then. You said today that I’d better quit planning on it – that it seemed a long ways off yet to you. It’s always just from one weekend to the next with me. If it wasn’t for your letters and thinking you will get to come home soon, it would be a whole lot harder. I don’t like it for your Major to say that this war will last a year and that you will probably go across [to Europe] soon. He’s too likely to know about it and boy, I don’t want you to be in all next summer fighting. I wouldn’t be a bit happy if I didn’t think something would happen real good before that time. Ernest, in one of his letters, said that he had been censoring letters all day and he was mighty tired of it when he came to a letter thirty pages long and the finest hand writing. It was to a girl in Oklahoma. Wouldn’t Ernest take the keenest delight in censoring our letters – not so much at what was in them as the idea. If you can’t come home next Sunday, I hope we will get a chance to take or send something you would like to you. If you want anything in particular, let us know. I hope you can send the message by W. C. G. Wouldn’t it be nice if this quarantine was just on the schools [and] not on the [military] camps? Then we could go up two or three evenings this week while I’m down here. I told [my sister] Bertha that you thought it would be nice if [her husband] Charlie gets to go to France. Bertha said, “Well I was going to write and have Charlie write to Ward, but if he’s going to tell Charlie that, she guessed she wouldn’t.” She probably will tho. But I don’t think she will let Charlie go. I think she is foolish. Charlie wouldn’t hardly be taking any risk and it would mean so much to him. Bertha and Charlie are going to take Jimmie Seaton if Mr. [Roy] Seaton goes to France. He’s a fine little fellow. Papa is working on the front yard. Maybe you think I’m not glad. I hope he keeps at it. Eben Scholer has been real sick with influenza and Lucretia wasn’t able to locate him. But she heard from out home he was sick. She called us yesterday and said she had found Eben and had been to see him. He’s feeling a little better now. Talk about a chopped up letter. I think this is sure one. I wish I could write letters like you, boy. When I think I haven’t anything to write about, if that one today was a sample. Let us know when you can how you are and don’t work too hard. I can take a deep breath everytime I hear you are well and alright. Ward, I’m going to college instead of trying to be a nurse. I know I would love to be [one] but for two reasons I am not. First is because I would have to train so long before I could go where I want to, and then I don’t want to because of what you said. I wish I was half as sure about your being here after the war as I am about myself. I know I’ll be safe and sound here at home (I would tho if I were a nurse), and if you will try harder to come back to me after this war if you know I’m here. Well here’s where I’m sure going to stay till you come, boy. Hattie’s apple orchard was set out forty-five years earlier by her father-in-law, Rev. James S. Griffing. The orchard was south of the Griffing home on College Hill, in the approximate location now covered by the parking lot of the Methodist Church. Minnie writes me about spending time alone at home with [her sister] Bertha, working on a school project with Stella Munger, and seeks my advice about attending KSAC next year. Your mother called this afternoon. She said she had a letter from you. You were well, but working hard. I’ll bet you are tired these evenings after drilling so hard all day. But it’s sure fine weather. It seems so funny to be home this time of year during the week. We did a big wash this morning. It sure was a big one. We didn’t get thru till this afternoon. [My sister] Bertha and I were left alone here this afternoon. It seemed nice. We haven’t been together alone at home for so long. Stella [Munger] and I are going to get a couple of boxes and fix up our museums this week. We’re going to put shelves in the boxes and paint the outside. Stella can do the carpenter work -- I don’t know the first thing about it, and I’ll do the painting. I like to do that. I asked you in one of my letters about those seeds you once said I could have, but you’ve never said anything about it. I guess you haven’t thought about it when you’ve written. I don’t see how you could remember anything I say. I say so much, it’s so removed from your interests right now. War news don’t sound as well now. I guess the peace talk was mostly “piffle” anyway. But just the same, the Germans are turning yellow and the Yanks aren’t going to let up either till we have a real victory. I put some “mange cure” on my head this morning to get rid of the dandruff. It’s certainly the most terrible smelling stuff I’ve ever been around. I wouldn’t be a bit surprised if this letter would have that odor. I don’t see how it could help but have. The other day, [one of my students named] Philip Chalmers brought a folded piece of paper up and handed to me. I asked him what it was. He said, “Oh, it's some of my writing. I wish you would read it.” I read it. It was some poetry he had written entitled, “My Mother’s Bargains.” It was pretty good. I asked him if he had any more and he said, “No, this is the first I’ve tried.” Maybe I have a young poet in my school. Bertha bet me a box of candy and a dollar that you would get to come home before you go across [to Europe]. I sure hope I lose my dollar and candy. Ward, if you don’t get a chance to get me something, don’t let it bother you at all. It certainly would be fine and just like you, boy, to think of things like that when you are kept so busy with such a big work. Your mother had quite a bit to say, but Mama was talking to her and the wind was blowing so hard she couldn’t hear near all. Mama asked me awhile ago to call her and see what all she had to say. The wind has gone down now, but I thought I would rather wait till morning. I want to talk to her then and see what news she has heard from you. Ward, I think you have the grandest mother ever. I always have thought lots of her, but I’ve been with her so much more since you went away. I’ve been over there every weekend but one since school began. I sure do love her. She couldn’t very well help but be so good when she has a son like you, boy. She knows I think lots of you and she is just so good to me. I sure hope I’m worth it. Bertha and I are thinking of having Ida, Kate, Stella, Brownie, Tina, and Ethel [Arnold] here for dinner some day this week. The afternoons are so short that we wouldn’t get much of a visit if they came over three or four o’clock – that’s the time we usually get together. Ward, I can’t decide whether to go to college next spring or not. In a way I want to, from first of March till the first of September will be a long lonesome time if I stay at home all that time. Then I’d like to get that much college in. You know my school lets out just in time for spring term and then again I don’t know if it would be wise. It would probably get me all mixed up for the rest of my college. Then if the war should be over next year and they do away with the S.A.T.C., they may change back to the two semester system in which case I’d be in an awful mess. Then again, if I would go next spring, go to summer school, take heavy correspondence work, I could make up a semester and it would probably be the best thing in the world for me if I would just be kept awful busy with school work next summer. I wish you would tell me what you would advise me to do. You are the only one I know that knows about college work that would be interested enough to advise. It’s quite aways off but yet I’d rather like to know what I was going to do. One reason I objected to having this week off [is that] I thought it would keep me from going [to college next spring]. It won’t tho. I can take one week Xmas vacation. The National Defense Act of 1916 passed by Congress established ROTC, then called the Student Army Training Corps (SATC), renamed ROTC in 1920. By 1917 the Corps had grown so large that they hired their first full time secretary, Mrs. S. P. Winters. There were 431 officers and 1703 enlisted men from KSAC that served overseas in WWI; 48 never returned. The SATC Program initiated at Kansas State University in Spring 1918 was quickly demobilized after the signing of the Armistice in 1918 but reappeared on campus at the beginning of the spring 1919 semester. The entire school was closed for a time in 1919 due to an influenza outbreak on campus which later spread to the 257 cadets; four died as a result of the epidemic. 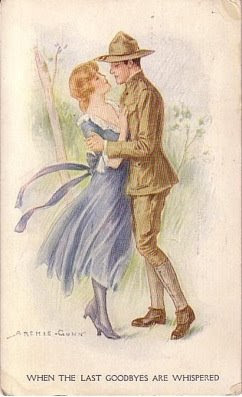 After being in camp for six weeks, I write Minnie about being picked for the ‘model company’ of the Regiment. Well Kid, I am glad to say that I can still write, “I am well.” In fact, I am not a bit afraid of the “flu” now although a man in the next tent who had been feeling well all the time was sent out just this afternoon. One of the boys from Kansas State Agricultural College by the name of Norman was taken out last evening & died during the night sometime. It sure shocked me because apparently he had been well before. But don’t worry anymore because the “flu” is nearly thru up here. I am hoping the quarantine will be lifted by next Sunday & that you folks can come up & get me, if I can get a pass. I tried to get a call thru to you last night but didn’t have any luck. If you lived in town as Alice Bobeck does, I could talk to you occasionally. I sent out a card last night saying something about extra drill. Now I will explain how it is. Friday night the company commander called the noncoms & some of the acting noncoms (I was one of the latter) down to the orderly room & picked out about 18 or 20 of the best, or perhaps I should say 18 or 20 from among the best. These men will be formed into a company along with other picked men from each company in the regiment. This company of picked men will be trained as the ‘model’ company of the regiment. 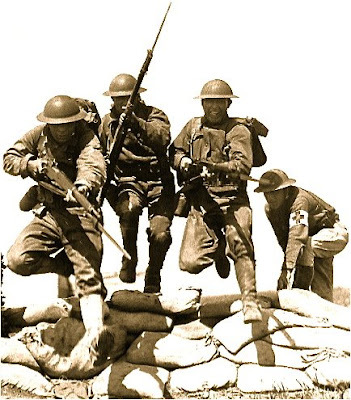 We go down to Smoky Hill Flats tomorrow morning & will receive very intensive training along such lines as bayonet fighting, hand grenade throwing, bomb throwing, gas attacks, trench fighting, automatic drill, etc. then we will be brought back to act as instructors – that is, those of us that can teach. Some can learn the work fine & all but can’t teach it. I am afraid that will be my trouble. I am not afraid but what I can stand the work & keep up with the others even if some of them are old men & old noncoms, but I never did teach anybody anything. I sure think I am lucky to get to go because it is quite an honor even if we did have to drill on Saturday & Sunday when the others were laying off. We only drilled till noon today, however. We will only take our bare necessities – blankets, toilet articles, a change of socks & underwear, mess kit & cup, raincoats & maybe our sweaters -- those who have them, and of course our rifles. We who are going were issued the new Enfield rifle this afternoon. It has a bayonet about 18 inches long. As I heard one man say, he thot the army life was alright until he got to working with that bayonet & then he said it was nothing to laugh at after he got that old knife out there on the end of his rifle. It didn’t look funny anymore. I won’t get a chance to send or to receive any mail so don’t worry if you don’t get any mail for a week. Sunday evening. Gee whiz, somebody yelled “Ward Griffing’ so I stopped writing & went out & Sergeant Conrow said there was something down at his tent for me. I went down & he had just come from the road where his folks left your box of candy & a box of cake & a bag of apples from Mama. Believe me, we had a feed. I called in [James] Sparks, Johnny Clarke, Walter Creviston, & Roy Drown. Oh my, but it seemed like Christmas. We had to eat everything tonight because I can’t take anything like that with me & I am going at 7 in the morning. Minnie writes me from Manhattan on Sunday night to say she has had long talk with Stella Munger. Well, it’s Sunday evening and this is the first time that I’ve spent at home without you here. It seems like I’ve been at Sunday school all afternoon and am waiting to hear your knock at the door. I almost listen for it in spite of myself. After dinner today, we hurried over to your place to leave the candy for Conrow’s to take. We got over there (Bertha, Ruth, Lester & I). Conrow’s hadn’t come yet so we stayed. They came after awhile, then after they left, we took your mother and Carol over to Munger’s with us. We all sat around in the parlor and talked. Stella [Munger] and I had a real talk for the first time since we’ve been teaching. You can just imagine how we sounded, can’t you? Lots worse than a pack of geese. Lester took Dean down to meet the [interurban railway] car. Lina, Carol and Charlie went along. [Your brother] Willis had gone downtown this afternoon. Your mother left a note telling him where we had gone, so he came over to Munger’s when he came home. I thought maybe I’d have some news for you when I came home from Munger’s but I guess I haven’t. Stella is going to have a box supper night after Halloween. I’m going out if I can. It’s going to be on Friday night. Roy is up to Arnold’s this evening. We noticed him when we came by there tonight. I almost envy Ethel [Arnold] tonight. But darling, I think my boy is so much better that it isn’t hard if you don’t see him. Thoughts of you, Boy, are to me, what seeing their lover is to some girls. When I see some soldier boys get out their cigarettes and light them, then my thoughts go right to you. And oh how proud I am of you. I would liked to have crawled in the car with Conrow’s, but I was afraid the folks would miss me. Minnie writes me that the war news from Europe sounds promising. Advises me that her school will be closed due to the Governor’s Proclamation and that she will remain in Manhattan all week. I won’t get to see you after all. Your mother called this morning and said Mrs. Conrow talked to the boys and they said you were well but there wasn’t any use for us to try to see you. You had to drill all day. My, isn’t the war news great? The Bulletin yesterday said that an answer from Germany was on the way back and it is thought to be favorable to the President’s message. I do hope that Germany will withdraw her armies from the Allied soil. Then I think the worst is over. It’s great the way those American boys are fighting. The paper says, “They march ahead as if marching on parade.” That will scare those old Germans too. It seems funny not to have any church. It’s the first time in my life that I’ve known of all churches and schools being closed. There’s lots of things happening now tho that never have before. I’m not going to have any school this week. Miss Carey gave me to understand that the Governor’s Proclamation was to be obeyed. But there’s only 18 in our school and they said any gatherings of more than twenty people were to be dispersed with. So send your letters to Manhattan instead of Stockdale please – for this week at least. Your mother just now called. She said [James] Sparks got a pass. That makes me rave. How in the world did he do it if he didn’t tell them he was married? Ward, boy, if this quarantine is taken off some time this week, won’t you come down in the evening if you can? I’m going to be at home so we can all visit a few hours anyway. I expect it will be your turn to get off next Sunday. I sure hope so. I’m wild to see you. Mrs. Conrow is going up. She’s coming over to your mother first tho and get some things she wants to send. I’m going to quit writing pretty soon and make you some candy and send it with Conrow’s. Your mother said, “Maybe Minnie will write a letter and send.” Mama said, “Well she writes every hour.” [Then your mother [said], “Then maybe she’ll write two letters.” I guess the folks do think I write a good deal. I only wish I could, and had something interesting to write to you more than I do. I took out a hundred dollars worth of Liberty Bonds. I couldn’t pay it in full so I took them on the installment plan. I’ll pay it all in November. I thought that would be a sure way of holding on to my money and I’ll have quite a bit in the spring besides. Stella [Munger] called up this morning and wanted us to come over today. I told her I would go after three o’clock. I won’t leave here till after that. I thought possibly you would call me. I don’t suppose you will since you have to drill, but I’m not going to take any chances. Cecil Haines is in the Depot Brigade in Detection Camp No. II. Do you ever see him? Or do you know him? He was a real good friend of [my brother] Jessie’s. I talked to his sister Edith yesterday. He’s been up there every since, while we were in [4-H Camp in] Hollister [Missouri] and is in the 27th Company. Homer has the influenza at home and Everett has it at the College. So far you have been luckier than they have been. Dean is home today. Ethel [Arnold] said she guessed she would half to get married so Ray could come over [from Camp Funston]. I wish I were writing this after my visit at Munger’s. I would probably have lots of things to tell you. But if I have [time], I can write them tonight when I write to you. Cecil Haines was the 21 year-old son of 60 year-old W. D. Haines and his 50 year-old wife Myrta. After the war, Cecil worked as a pasteurizer at a local Manhattan dairy. Minnie's brother, Jessie Jonathan Frey, was born 6 November 1893. Minnie writes me from Manhattan to say she has hopes of seeing me on Sunday if the quarantine is lifted. Your mother called me up early this morning and had lots of good news to tell me. In the first place she said the latest they had heard from you. You were well. Then Alice [Bobeck] (I can’t remember her last name so half to call her that), called out last night and she had been talking to [her boyfriend James] Sparks and she said you were alright. That is certainly good news. I think you surely must know how to care for yourself, to have escaped so far when so many are getting that [flu]. And boy, I have hopes of seeing you tomorrow. Isn’t that good news? Alice said Sparks said we could come up tomorrow and [your brother] Willis said he would go if we could sure see you. All the girls [school teachers in Riley County] are going to be home this next week but me. And maybe I will [too]. I told them I thought we had better have school if we could. There’s so many primary children in my school and this month is so much better for them to attend than the last of March will be. Papa is going to find out this morning if I have to close then I’m going to call up the board if I’m going back. If I get to go up to see you tomorrow, I’ll be glad if I don’t have to be back Monday. Then we can have a long visit with you tomorrow. Maybe we can stay in the evening till you half to leave us. Yesterday when the mail man came, he said, “Well teacher, I don’t believe I have a letter for you today.” I looked at the bunch of letters and noticed the red triangle on one. I said, “Here, isn’t that for me?” He laughed and said, “No, that’s from the Buss boy.” But when I saw it, I sure thought it must be for me. He’s sure a good man. I suppose you boys are feasting on a cake – your mother said she sent you one. You know last year [my brother] John didn’t do very well in High School. This year, he and Lester started in like they meant business and I guess they are getting results. John brought home a “one” he made under Miss [Stella K.] Stuart and another from his Agriculture teacher. Lester made a “one” in Algebra. And they seem to be getting along fine in all their subjects. We are certainly happy over it. I am certainly happy over it. I am so anxious for the boys to do well in school, then they’ll go on thru college. I went out a minute ago to get weighed again. I gained a pound and a half this week as usual. I weigh 123 now. When I went up there [to Sherman Township to teach] I weighed 112 ½. If I keep that up, I’ll be quite a block by spring. I won’t tho. Ward, I sure don’t think you get payed very well, but I guess they think you get plenty to eat and wear, and that’s all you need when you’re working for Uncle Sam. Lina used to do Dean’s washing but when they began taking out a dollar for laundry, she quit. But I think it’s the limit to take a dollar from you boys and then make you do your own washing. Lester Raymond Frey was one of Minnie’s younger brothers. Born 21 April 1903, Lester Frey grew up to be a dairy farmer like his father. Stella K. Stuart, a 37 year-old Riley County teacher in 1918. Simon Tjaart Buss, born 24 November 1887, was the 30 year-old son of Henry B. and Emma J. Buss. Henry was German emigrant farmer, born about 1857. His wife, Emma, was born about 1865; her parents born in Switzerland. The family farmed in Sherman Township, Riley County, Kansas where Simon was born. Simon's draft registration card indicates that he was tall and of medium build, with blue eyes and light brown hair. I am well but am drilling extra hard in a company of picked men. We will be sent to Smoky Hill Flats Monday for intensive special training. Will drill tomorrow so may not get time to write but will write when I can. Am sure glad I got in on this detail. I write a letter to my mother to let her know that I am still alive. I finish the letter the following day and inform her that I have been selected with 19 others from my company for special training. I also include a note to my niece, Carol Cunningham, who lives with my mother and brother Willis. Dear Folks, Well the “flu” hasn’t gotten me yet and I am beginning to think that I will get by without getting it. If I do, I will consider myself lucky because so many got it. It sure pays to take care of yourself as much as possible when you’re in the army because nobody else will look out for you. Well this letter is somewhat broken up but I expect it will reach you sometime. Last night when I was writing the first part of this letter, [Clinton] Scott brought in that package of candy and nuts so we celebrated and I thot I would get to finish my letter today but I couldn’t because I had to drill instead of having a holiday as most of the others did. Last night about 20 picked men from the company were ordered to report to the orderly room. I was lucky enough to be one of them. These men will join other picked men from the other companies of our regiment and will form a crack company. We had to drill today and we will drill tomorrow. When I say drill, I mean drill too because it was sure hard. Old non-commissioned officers and new non-commissioned officers are drilling right in the ranks with us. In fact, most of the picked men are noncoms or at least acting noncoms as I am. The first of next week, this picked company will be taken to Smoky Hill Flats where it will receive special intensive training along such lines as bayonet work, trench fighting, bomb throwing, etc. It will be very hard work but I am sure glad I will get to go because it gives a fellow a chance to see what he is made of and it is quite an honor too. If I only keep well, I think I can stand up with most of them and I think I will. I sure am tired tonight. We have drilled fairly hard all the week and were looking forward to a good Saturday and Sunday layoff but instead of that, we have to work about twice as hard as usual – but I wouldn’t miss it for anything. The influenza seems to be slacking up here but there are still plenty of cases. Quite a large number are dying but I think that is slacking up also. Don’t be surprised if you don’t get a letter from me for a while because during that special training next week, I may not have the time or accommodations to write. But I will try to at least drop you a card to let you know I am still alive. I got a letter tonight that you wrote on October 4. It must have gone to some other company first. I got your letter today telling about the Cunningham troubles. They sure are having their share, and then some. You folks must be careful and keep well because you can neither one get along with the other sick. Bill [Willis], you sure are blowing yourself on calves. Don’t sell too short of feed. Both of those deals sound good; better than going to Kansas City. Don’t you think Mr. Munger’s old mare is too big for our purposes? She would be hard to mate. What you said about Hays’ sale surprised me. Do you remember Becker? He was one of the men picked from the 36th Company for that special training and I saw him out on the field today, but didn’t get a chance to talk to him. Minnie writes me about a moment when she thought the school board was going to fire her. Says she still likes her school and enjoys playing with the children. Home again [in Manhattan. My brother] John came up this evening and got me about six o’clock. I wasn’t quite thru cleaning the school house when he came. I had to do an extra good job. I don’t suppose I’ll go back next week. Then I had to grab things together in such a hurry when we got down to Parkerson’s. On our road home, we got stuck in the mud. John said the road was just fine going up and it had rained while he was up there waiting for me. It was awful for a mile or so and we didn’t have any chains. I guess [my brother-in-law] Charlie [Scholer] has had the influenza and is getting over it. Fay Seaton called out tonight and asked [my sister] Bertha if there was any word. She wanted him to take to Charlie. He is going to Washington [D.C.] to see Mr. Seaton. Mrs. Seaton and the two babies were buried here today. Ethel [Arnold] came home yesterday. She will be home for a week now at least. Kate called my sister] Bertha tonight and told her that Frank [Blair] said the influenza had died down in Washington [D.C.]. She’s happy. Bertha is going to send Frank’s address to Charlie. The school board came to my school this afternoon. I was scared. I thought they had come to fire me. No, they came up to see what I thought about closing school [due to the influenza epidemic], turning the clock back, etc. [My brother’s] John and Lester went to a party tonight down at Blockasky’s. They wanted me to go with them, but I was altogether too tired. I sure would have liked to tho. I haven’t been to one since Ethel Arnold’s birthday party, I guess. I wouldn’t care much about going to one on College Hill tho. I would miss you too much. Bertha has changed her plans about going to Washington [D.C.] a week from today. She’s afraid it wouldn’t be wise to take her baby then. Ruth is awfully fussy tonight – she isn’t feeling well. I didn’t hear from you today so I thought perhaps you were transferred or you might be sick, but the folks had a card from you today so I guess you are all right yet. That is certainly fine. I took a picture of the [school] children today. I sure hope it is good. Ward, I am getting to like teaching up there better every day. I know I’ll just hate to leave when spring comes. I just love all those children – better than I ever thought was possible for a teacher to. But they are every one so good to me. It’s teacher this, and teacher that. They are just wild for me to play with them at recess and noon. And I sure like to get out and tare around with them. We play “keep away” with the ball, mostly. I like teaching lots better than going to school. I used to think I’d rather go to school than anything else. Not anymore do I think that. And I feel so much better. I’ve never in my life felt so well physically and in such good spirits as I’ve been since I began teaching (not that I’ve ever been an invalid – far from it). I’m going to college next winter, I guess, because I feel it would be best for me. My brain needs developing. And as George Haas would say, “I must be a cultured woman.” I don’t look forward to it with the anticipation I use to tho. Maybe I will if you come back soon. I’ve always been so anxious to go to school with you. Along school lines, we’ve never been interested in the same thing. Even if we are not in the same class, we would be in the same school. Daylight Saving Time was not formally adopted in the U.S. until 1918. 'An Act to preserve daylight and provide standard time for the United States' was enacted on March 19, 1918. It both established standard time zones and set summer DST to begin on March 31, 1918. Daylight Saving Time was observed for seven months in 1918 and 1919. After the War ended, the law proved so unpopular (mostly because people rose earlier and went to bed earlier than people do today) that it was repealed in 1919 with a Congressional override of President Wilson's veto. Daylight Saving Time became a local option, and was continued in a few states, such as Massachusetts and Rhode Island, and in some cities, such as New York, Philadelphia, and Chicago. Ruth Lillian Scholer was born 24 February 1918 in Topeka, the daughter of Charles and Bertha (Frey) Scholer. Ruth would grow up to marry Howard Liebengood, a graduate of the KSAC Veterinary School. Ward’s son, William J. Griffing – also a veterinarian – would eventually buy out Howard’s practice in Bremen, Indiana in 1945. Probably 39 year-old George Haas of Madison Township, Riley County, Kansas, a German immigrant who ran a hardware store. Minnie writes me that she is frightened by all the cases of influenza in camp and neighboring towns but that she fears spinal meningitis even more. She also mentions Kansas Governor Capper’s proclamation. I got another letter from you today. You don’t know how nice it is to get a letter from you everyday. I’m so glad you were still well when you wrote that letter, but I wonder if you are yet. I would be so glad if you would escape it but I’m afraid you can’t from what you said in today’s letter. I had a letter from Mama today too. She said your Mother said if you got sick, she wanted to go up there and be right with you all the time if they would let her. But of course they don’t do that. I wouldn’t worry a bit if she could because I know you would be all right then. I’m sure getting scared. Mama also told me about Claude [Cunningham’s] brother, and Mr. [Roy] Seaton is very low. If the boys could just keep other things from setting in I believe they would be alright but Parkerson’s were in Manhattan today and they said from 60 to 70 boys were dying every day. It’s worse at Leonardville than at Manhattan. Mama said if I got sick, I was to come right home. But I’m not in the least afraid of getting it and wouldn’t worry if I did. But it’s the boys in the camps that I do think about. I’d hate to think you had to walk guard all night if you were getting it. That would give it such a head way. Clint Scott is getting well. He said he went right over to the infirmary as soon as he began to feel the least bit bad and they sent him to the hospital. He said he was awful sick for about four days but will soon be alright now. Parkerson’s heard that the Spinal Meningitis was breaking out again in camp. If they get that over there where you are, then’s when I’ll turn black because I’m strictly scared to death of that. 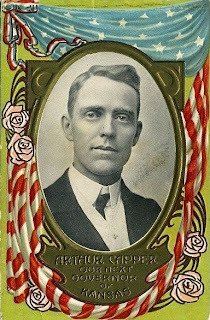 Governor [Arthur] Capper has issued a proclamation asking all schools, churches, theaters, and public gatherings of all kinds to close for a week beginning Saturday. So maybe I’ll not have any school next week. That will be a nice little vacation but it will put me a week behind in spring. I’m beginning to wonder again if you were transferred Wednesday. Your letter sounded like you thought there might be a chance. Ward, doesn’t your Major think there will be peace soon? I can’t see how there can help but be the way the papers sound. In a way I’m glad for you that they do think you’ll get across anyway – I believe you want to go. But I’m not the least bit crazy about you getting on the firing line. And I wouldn’t shed any tears if you didn’t get to leave the U. S. But if there weren’t so many diseases in the camps, chances for ships to be sunk, etc., it would be kind of nice for you to go across to be there for the finish. It would sure be some experience for you and I’m wild to hear your stories when you come home. I often think about that. I know I would just sit for hours and hear you tell about it all. I just love Mr. and Mrs. Parkerson. They are so good to me. And I have the most fun with them sometime. They are the happiest people and so good to one another. They speak so kind to each other and both are so willing to do for the other. It’s sure pleasant to be around them. I certainly have the boarding place. Boy, don’t say “when I leave for good” because you are not going to leave for good. You’re coming back again and I hope mighty soon. In your letter today you were talking about that April night over three years ago. Just last night I was thinking about it. If you are gone a long time, we’ll have to get acquainted all over again. I don’t believe it will take us very long tho, do you? It will be grand. Has the married man had the influenza yet? What will his wife do when he gets that? She sure can’t see him then. They are talking of closing the College [in Manhattan]. I write Minnie about such romantic things as taking care of my rifle and my feet. It got so rainy this morning that we came in from drill about 10 o’clock, so I will take some of this extra time in writing to you. There isn’t any news so I will write about most any old thing & so don’t be shocked if the letter is a little more chopped up than it always is. The first thing we must do when we come in on a day like this is to care for our rifles – clean off all the dirt & water & then give them a light coat of oil. Then if our feet are wet, we must change our socks. The infantryman’s first care is for his rifle & then for his feet. They are very particular about the condition of a man’s piece. I just now wrote a card home & asked Mama to send me a cake. One of the men in my squad got one from home & I never tasted anything so good in my life except some candy I got a while ago. There are so many men gone to the hospital now that we get all we want to eat & then some – but it is rough stuff. I believe the “flu” is slacking up now but if it stays cold & sloppy, it may go on. Some say tho that this change of weather will help fight the disease. That sure was too bad about the Seaton’s. I pity Mr. [Roy] Seaton. He sure has had his cupful of sorrow. It will be nice if Charlie [Scholer] gets to go to France. I hope he gets his commission. Our Major said that more than likely we would get to go before snow flies. He said that the war couldn’t be over for a year yet even if the papers are talking so much about peace. We drilled in the trenches for the first time this morning. I am afraid that you had better stop planning on seeing me, for then you won’t be disappointed when I don’t come for I am beginning to feel that my pass is still quite a ways off. In the letter I got from you last night, you said that if I could come home just once it would be the happiest moment you ever experienced. Kid, I am afraid it might be worse than none because I would just hate to have to come back [here], but I am coming as soon as I can just the same. I guess we are both looking forward to that day when I can come home & stay with such eagerness that it will make years out of months. Of course if you want to be a nurse, go ahead. But Kid, do you know that if you aren’t home safe & sound when I get out of this army, I will wish that something had happened to me too. Take care of yourself & I will do the same.